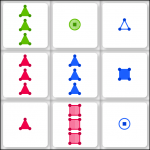 I submitted my first solo iOS game, “Traits,” to Apple for approval. It’s essentially an updated version of “Tripod,” which I wrote in 2001 as a Java applet: better graphics, sound effects, and more refined gameplay and options. The touch screen really adds a lot to the game. 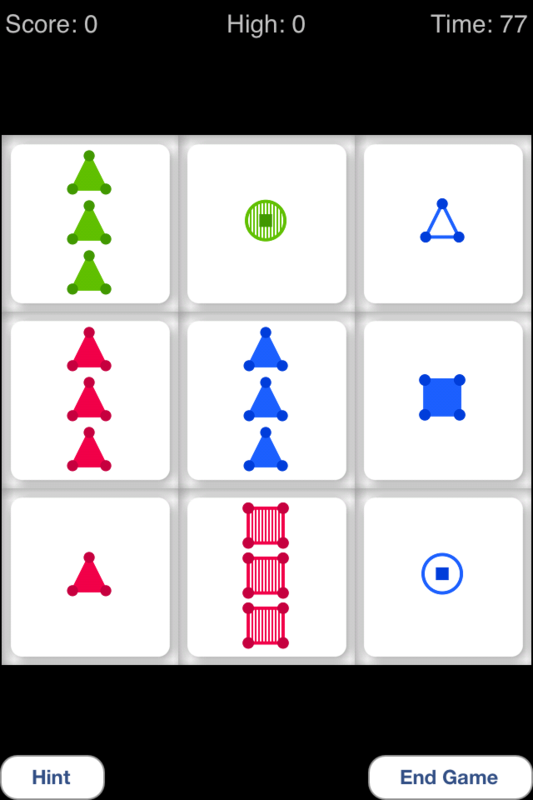 I made sure you can select tiles simultaneously with multiple fingers. The ceramics teacher announced on opening day that he was dividing the class into two groups. All those on the left side of the studio, he said, would be graded solely on the quantity of work they produced, all those on the right solely on its quality. His procedure was simple: on the final day of class he would bring in his bathroom scales and weigh the work of the “quantity” group: fifty pound of pots rated an “A”, forty pounds a “B”, and so on. Those being graded on “quality”, however, needed to produce only one pot– albeit a perfect one– to get an “A”. Well, came grading time and a curious fact emerged: the works of highest quality were all produced by the group being graded for quantity. It seems that while the “quantity” group was busily churning out piles of work– and learning from their mistakes– the “quality” group had sat theorizing about perfection, and in the end had little more to show for their efforts than grandiose theories and a pile of dead clay. So my observation was that I should just make lots of apps. Lots of art. And by “make”, I mean “complete”. Finish each project, and put it out there to be “judged”, or “received” if we’re looking for a gentler word. I put together a “marketing/support page” which Apple required, with more screenshots and gameplay notes. I hope you enjoy playing the game, when it’s approved. If enough people like it, I’ll consider doing an Android port. (1) “Top-down”: We pick something to focus on, like a small object or spot, and can put varying degrees of attentiveness towards that spot. One style of Zen meditation involves training that focusing-in ability. The book looks at what structures in the brain are responsible for focus and which allow us to move our focus around, at will; to willfully narrow focus on something we select. This top-down kind of meditation is one in which that focus-muscle is exercised by holding focus on a chosen spot (or even something non-physical, like an idea or concept) for long periods of time. In my own words, I observe something interesting happen when I do this: The more intently I focus on one thing, the more the background fades out. Those “word thoughts” which happen all the time start to come up as usual, but then are quickly washed away by the flood of my attention towards this one thing. For example, I was looking out the picture-window in the living room, focusing on the top of a tree. I looked at its shape, its color, its form. I didn’t consider any particular aspect of it, just made the top of that tree the spot I was focusing on attentively. I noticed how my thoughts stopped being able to bubble up, how that tree became all-consuming to my mind and almost completely blocked out other thoughts. After some amount of time had passed, I began to feel very comfortable, and I believe this is because my mind had let go of any negative emotions or discomforts related to a typical smorgasbord of thoughts, which had been percolating subconsciously. By placing my focus onto the top of this tree, after a while I had let go of most everything except… the top of the tree. I noticed that for some time after this, and after having exercised my focus-ability similarly for just a short duration (less than 15 minutes) the day before, I was able to be much more present to the people around me. I could apply my focus to a person’s face, while listening to them, if I chose. I observe in general that other people seem almost pleasantly surprised, and may think very kindly towards, someone who pays them such full attention. Others are usually not used to this kind of non-mind-wandering attentiveness towards them and on what they are communicating. Further, although admittedly this could have all been “in my head”, I felt a subtle mental “tiredness” after practicing focus in this way the first few times, as if my ability to do so had been so weak that these short practices had strained (and strengthened) it. (2) The other “school” of meditative training in Zen, which is initially a harder path, relates to “bottom-up” focus. This is the background awareness which causes us to turn involuntarily towards a noise, or towards something that moves in our otherwise-still visual field. Or to simply “notice” something in our peripheral vision. What part is paying attention to the larger visual field, and understanding what is happening in it? It is some part of us that is subconsciously aware. And further, beyond mere visual changes that we notice, some part of the mind is actively processing, in parallel, the entire scene. It is subconsciously drawing inferences and creating insights, each of which might call our attention and awareness in a given direction. Because the part of the brain which does this processing and associating is not dominant (our symbolic, language-processing half is dominant, as well as our Self-related, “I am here” -type of thinking, and connected with those the explicit “sharp” attention which we can consciously direct), we are generally cut off from these wordless insights (about what is happening around us; about what might be worth turning to look at) without becoming ever aware of them. Or else, the insights are stored, but generally don’t bubble up into conscious awareness. (Something may even call our attention in a given direction, but we may not yet “know” why.) A bottom-up meditative style means casting focus on the whole picture, and being receptive to what that massively more parallel kind of awareness is ascertaining. We’re used to that awareness “firing” (triggering us to look at something), but we don’t spend time strengthening that awareness of “everything” or being “in” it. It’s hard to learn how to “look at everything all at once” explicitly, let alone remain in that state for an appreciable period of time, but this is what the bottom-up style of training requires. An eventual goal of meditative training, or perhaps a side-effect, or a marker of progress along the path, is the achievement of a momentary state of consciousness where attention itself becomes so saturated with insight and input and meaning that awareness relating back to the ego-based Self– to the idea that “I” am here– drops out completely, leaving a direct and vivid awareness of the world, in the “language” of the non-dominant parts of the mind we don’t get to experience by themselves. In Zen, this is called “kensho” or “satori”, although the two mean slightly different things. These states are usually not encountered during meditation itself; meditation merely is the “weight-training” that strengthens the mind’s attentional systems so that they can be more present to the world around us, to the present moment, and not stuck in cycles of thought; these peak experiences are usually triggered by natural scenes of beauty and sublimity, and are very rare. The book describes the rough neurological basis for how the two attention systems work. It talks about neuroplasticity and how meditative training actually alters the structure of the brain, so that practice is accumulative over a lifetime. It emphasizes that although there are different schools of Zen, those that emphasize top-down attention; and those that emphasize bottom-up attention, that a balanced approach, training both methods of focus, is most productive. The everyday benefits of meditative practice are a decreased Self-centered-ness, and consequently a greater awareness of what one is doing, what one is casting attention towards and engaging in, with less fear, worry, et cetera, and more confidence stemming from greater understanding of reality. Learned tasks which should remain on autopilot can more easily remain such, allowing us to appreciate what is actually around us. (As in: “I will let me body take care of this, and I will watch and appreciate what it is doing.”) By focusing what comes into our awareness, then, we become more interested in others and in the world itself than on how the world relates directly back to the ego-based Self, and on our momentary thoughts (especially those we unnecessarily put into words, mentally) which give us little insight. In general by being able to examine our own thoughts we can recognize that the “I” is something separate from the thought: we are not our thoughts. What is doing the thinking? Why does this thought cause this emotion? What is experiencing the emotion? Oftentimes the cause of the emotion is Self-centered; it is then possible to objectively decide that some attachment which generally leads to that emotion is not useful, and because we have increasing power over what we decide to pay attention to, it’s possible to let the thoughts which bring about negative feelings dissolve, or be understood within a sandbox that allows us to not have to suffer and be servants to them. Rather than “detachment” from life (it’s difficulties and joys), meditative training allows us to be far more involved, far more intimate with it– but in an examined, intentional, increasingly wise and aware way– rather than a blind, uncontrolled, unengaged or absent way, or where one is present mainly just to one’s own Self-related thoughts, or thoughts that come from the ego. Detachment does not mean disengagement– on the contrary, it allows deeper, wiser, more productive and satisfying engagement. “Zen” has many meanings; at its most basic, it’s simply a form of meditation (that’s what the word literally means), but I believe there’s a popular misconception about what meditation is. I used to think it was just mental relaxation. Or visualization, which the aim of relaxation. I didn’t expect to get much out of it, and I already felt like a pretty calm, relaxed person. That was before taking a basic meditation class, where I realized that the calm one feels in an ordinary mindset (with thoughts wandering, even if one doesn’t feel like these are emotionally-heavy ruminations) does not compare to the magical “empty, clear and light” state which descends during basic meditation. Even that takes patience and self-discipline. What this book argues, though, is that meditation is much more than even that (a temporary mental state, which may leave one feeling refreshed or renewed). It is rather a sort of weight-training regimen for the attentional systems of the mind, which trains both the narrow and the wide systems, and which influences detectable changes in the physical brain as long-term practice proceeds. Further, because meditative training also trains the habit systems which control how we re-focus and re-adjust our attention, it brings us the ability to tune ourselves (largely our reactions, regarding which we were less consciously aware) voluntarily to be in greater accordance with our values. This in turn accelerates a general lessening of fear and an increase in confidence in all areas of life. Although I’ve let this blog and my site itself languish for a long time, I think it would be nice to have a place where I can post and collect my thoughts, which is not Facebook or Google+. I deleted this blog a while back because the version of WordPress I had running probably was susceptible to a hack which was allowing a bot of some kind to inject malicious code into PHP files on this site; also, I wasn’t using it. Further, the majority of my old entries seem somewhat silly to me now. So I didn’t see value in tracking down the WordPress problem, felt it was simply time to move on, and deleted the site. On the other hand, there’s value to us in seeing “where we’ve come from”. So as painful as some of these posts are, that’s just what I was thinking at the time, and for the most part, I will let them be.